According to several Dutch websites a new carp record was caught recently, breaking the previous record carp from 'De Nieuwkoopse Plassen' from 2000. 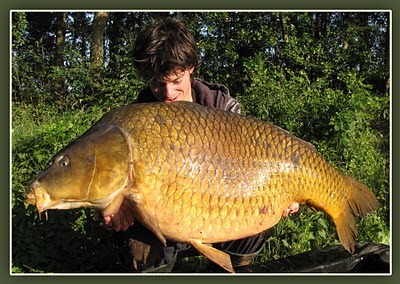 The huge common carp was captured at 32,5 kg (71,65lb) at an undisclosed location in The Netherlands. 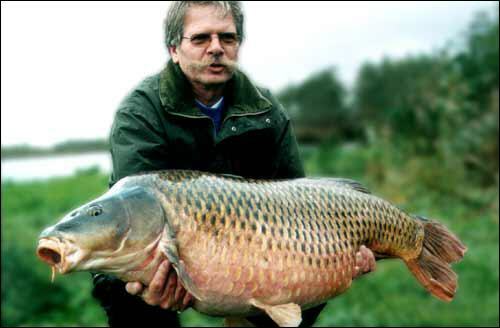 In 2000 Joop Butselaar caught a huge common carp (picture below) at de Nieuwkoopse Plassen at almost 70lb. It took 11 years before this record was finally broken. Although little is know about the fish (a Dutch magazine will reveal the details about the new record in it's next issue) it is considered to be about a common carp with a high back that was captured several times in the past weighing in at more than 30kg. 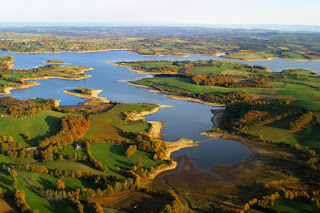 It is supposed to be the same common as displayed in the picture below, taken a couple of years ago. Is this the new Dutch carp record at 71,65lb? When more details will be made public, we will of course update this article. Interesting is that the Dutch carp fishing record still lags the Belgian carp record by quite a big margin. Just recently the carp record for Belgium was broken with a 82,56 lb mirror carp, breaking the previous record of 82,5 lb (a huge common carp) taken in 2009. Read everything about the Benelux carp record below. UPDATE: Picture of the record carp, caught by Dutch specimen hunter Ronny Kivit.